Weather on the ice today was good, fiiiinally. The team spent lots of time digging out boxes and tents from the huge snow drifts, but still managed to install the last of Mike snow compaction compaction instruments. 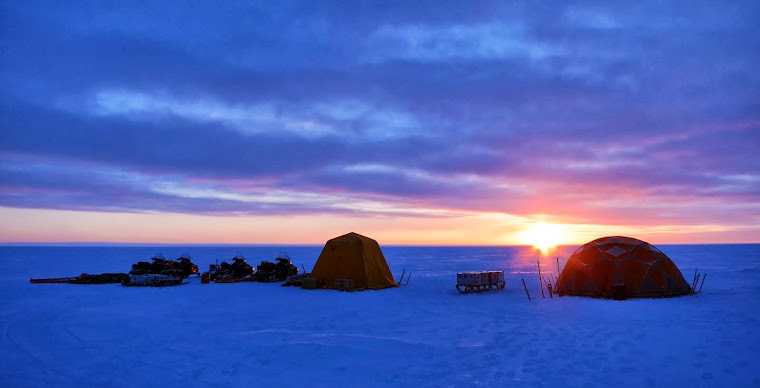 From now on, nearly all focus will be on moving across the ice sheet, taking radar measurements of ice layers in the snow, and drilling ice cores. A highlight was a gift from Drew, who is one of the three people keeping the runway open during the spring and summer. Apples and oranges. First fresh food in weeks! Tomorrow more calm weather forecasted, so ACT-13 will try to break up camp and move to the next camp location (confusingly called "camp 2"). In the mean time Babis, Mark and Dirk returned to Copenhagen today. From now on it's all up to Karen, Alex, Horst and Mike.